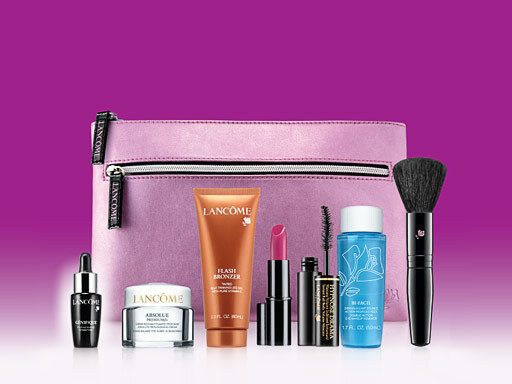 Lancome "Choose Your Goodies Gift Set"
This "Deal Of The Day" is a great find because you get to "choose your goodies" instead of a bundle of beauty items you will never use! First you get to choose from two hot spring color bags (pink or silver) hurry- quanites are limited, pink will run out first, an automatically comes with a deluxe artist makeup brush that's not cheap! Then the neat part comes Next- you can choose any 6 out of 12 " Lancome" beauty Essentials, which include: G'ENIFIQUE youth Activating Concentrate, ABSOLUE PREMIUM BX Cream, R'ENRGIE LIFT VOLUMETRY Cream, HIGH R'ESOLUTION REFILL-3X Cream, FLASH BRONZER self-Tanning leg gel, COLOR DESIGN Eye Shadow Quad, COLOR DESIGN Lipcolor, EFFACERNES Waterproof Undereye Concealer (choose one of three shades), JUICY TUBES Lip Gloss (my personal favorite), LE CRAYON KHOL Eyeliner, HYPNOSE DRAMA Mascara (this stuff lives up to it's name), and BI-FACIL Eye Makeup Remover (A $130 Value). Now these gifts are only available until April 3, and while supplies last and if you know like I do, you'll need to hurry because this deal will run out fast! I recommend purchasing online rather than going into the stores as your supply and choices will be better! So where can you find this "Deal Of The Day"? Click here to find out!